Contents: 44 pages plus covers, photographs, colour plates. Advantages: Many colour profiles; wide variety of schemes; good timing with impending re-release of Mirage F.1; interesting spread of subjects; helpful text and supporting photographs; high quality presentation; colour cross-reference table for South African aircraft and armour. Disadvantages: May be difficult to obtain outside of South Africa. 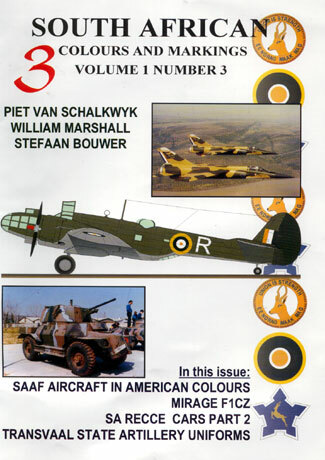 The third edition of "South African Colours and Markings" is printed in full colour on high quality glossy paper. Its 44 pages plus covers are in A4 format and centre-bound by staples. SAAF Aircraft in American Derived Colours Part 1. The aircraft include Baltimores, Marylands and Bostons with many photos and colour profiles. Mirage F1 CZ. Modern Postwar Colours in detail. Many profiles and colour photos illustrating the striking schemes and markings applied to this streamlined aircraft. This article will be especially interesting to modellers choosing to build a Mirage F1 using the recently-released decals from Albatros Decals. In 1/48 scale, the old but respectable ESCI kit is soon to be re-released by Italeri. SA Reconnaissance Cars Part 2. British, New Zealand, Dutch, West African, French and many more countries usage of a variety of South African armoured cars. Photographs and profiles are supported by informative text. Colour Charts - FS Number cross-reference chart for South African Air Force colours; plus a second table with the nearest FS, BSC or Humbrol colour match for South African Reconnaissance Cars. In my opinion, the highlight of the book is the colour artwork. Each subject is lavishly illustrated with between 20 and 30 colour profiles each.